iMessage is a free instant messaging service provided by Apple to their users having iOS 5 to the latest iOS 12/11.3. iMessage enables them to send free text and picture messages among other Apple users. Unlike other messaging services that require a text message plan from network service provider, the iOS devices simply use Wi-Fi or mobile data connection to send messages globally for free. Along with text messages, iMessage allows you to send unlimited pictures, videos, contacts etc. to individuals or group of members anywhere at anytime for free. It is important to all the users as it helps them connect with their friends and family living all over the world, allowing more frequent business communication internationally due to its free service. Hence, it can be really inconvenient for users if the iMessages gets deleted on purpose or accidentally as it may contain important and private messages. This article introduces three ways to recover deleted iMessages whether you have a backup or not, and they work even you use iOS 12/11.3. The iMessages can be easily recovered using any of the above three ways with a third party recovery tool. One of the most popular tools to recover lost data easily is iMyFone D-Back iPhone data recovery for Win or iMyFone D-Back iPhone data recovery for Mac which helps you in iMessage recovery and other lost data recovery very easily. Recommended by famous media sites like Cult of Mac, and Makeuseof. 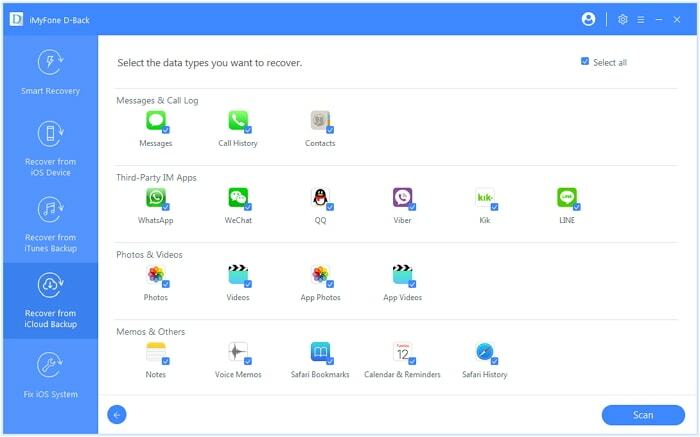 Supports recovering 22+ file types such as photos, videos, contacts, notes, voice memos, WhatsApp messages from iPhone. 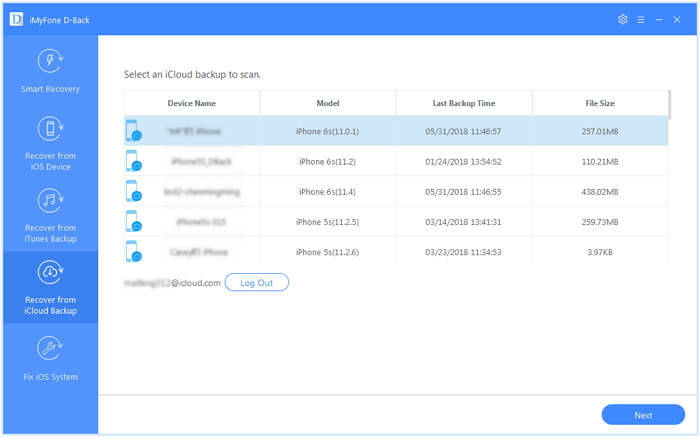 Provides 4 recovery mode to get back lost data: Smart recovery, recover from iOS device, recover from iTunes backup, recover from iCloud backup. Preview the recoverable or extractable data before recovery. Compatible with iPhone X/8/7/SE/6s (Plus)/6 (Plus)/5s/5c/5/4s/4 running iOS 7/8/9/10/10.1/10.2/11/11.3/12. 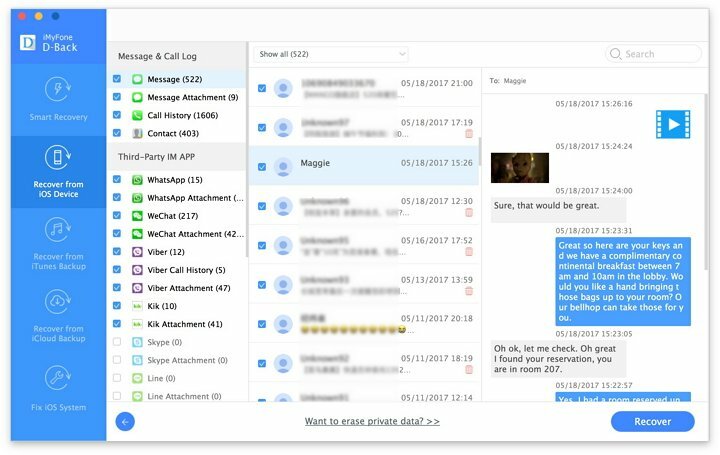 You can also use iMyFone D-Back to recover deleted notes from iPhone, recover deleted WhatsApp messages from iPhone, etc. Just download and install iMyFone D-Back on your computer now. It is available for both Mac and Windows. Step 1: From "Recover from iOS Device" click on the option "Start" button. Connect your iPhone with your computer using a USB cable. Once the device is detected, click on the 'Next' option. Step 2: On the next screen, click on the checkbox adjacent to the option 'Message', and then click on the option 'Scan'. The program will start to scan your iPhone. Step 3: Once, the scanning has been completed, the new window shows the preview of all the deleted messages. After the preview, select the messages you want to restore by clicking on the checkbox next to it. Finally, click on the 'Recover' option. Step 4: A new pop up window appears, asking you the location where you want to save the recovered messages. Select the desired destination to start the recovery process. It takes a few minutes for the recovery process to complete. Check this video for more details on how to recover the deleted iMessages. Step 1: From the option "Recover from iTunes Backup", click on option "Start". Then the program will show you all the iTunes backups detected on your computer. 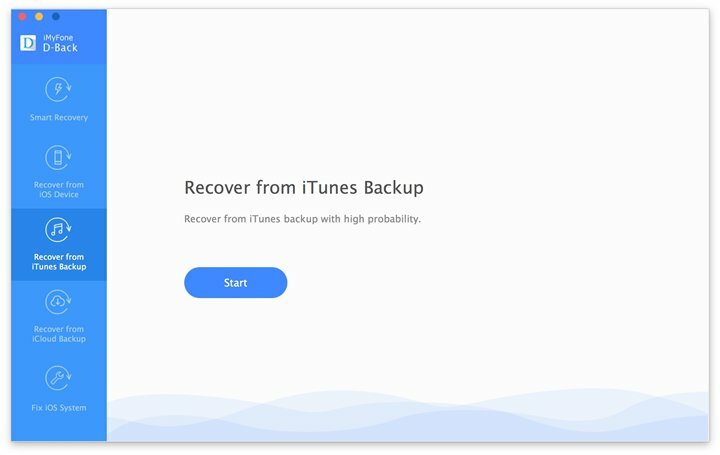 You can choose the iTunes backup which you would like to recover your deleted iMessages from, and click "Next". The backup made for iOS 12 is also supported. Step 2: A new menu appears which asks you for the type of files you want to recover. To select imessages, click on the checkbox adjacent to the option 'Message'. Then click on the option 'Scan'. Step 3: After the scanning has been completed, the new window shows the preview of all the messages including the deleted imessages. Preview the specific content of them, and check the iMessages which you want to recover. Step 4: After you click "Recover" button, a new popup window appears asking you to select a location for the recovered messages. select a destination folder and then wait a few minutes for the recovery process to be completed. Step 1: From "Recover from iCloud Backup", click on option "Start". Step 2: The program will prompt you to enter your you iCloud account details. Then it will show the list of all the iCloud backup files available in your account. Select the backup file from which you want to recover iMessages by clicking on it and click 'Next'. 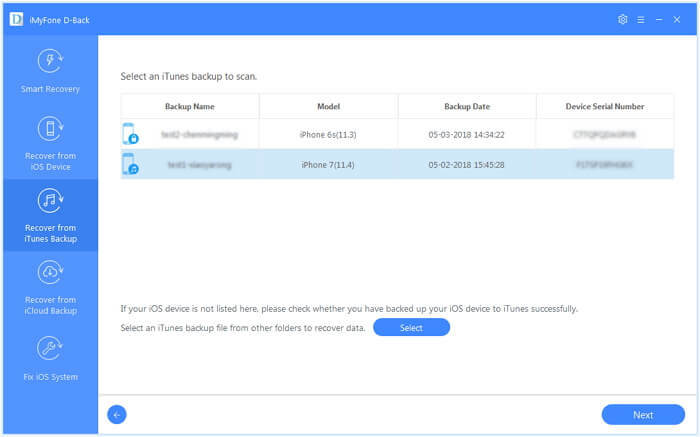 The program also supports to recover iMessages from the iCloud backup made for iOS 12. Now you need to choose the data type to recover. Check the box next to "Messages" and then click "Scan". The program will download the iCloud back and scan all the messages including iMessages in the backup file. 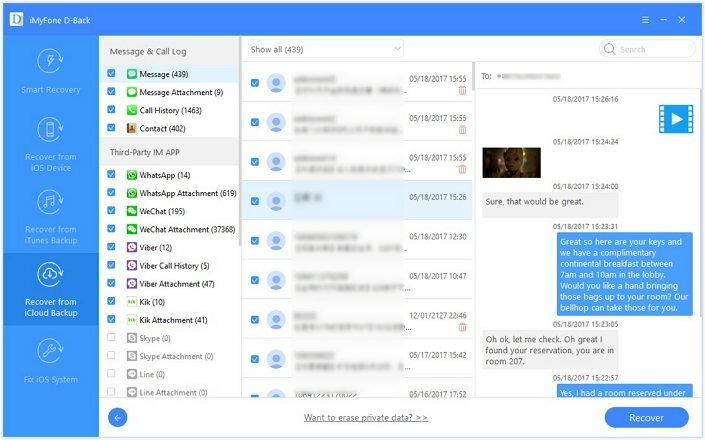 Step 3: After the file is downloaded and scanning has been completed, the new window appears that shows the preview of all the deleted messages. Select the iMessages which you want to recover by clicking on the checkboxes adjacent to them. Step 4: Click "Recover" to start the recovery process and a new popup window will appear. Select a location to save the recovered messages and then wait for the process to be completed. 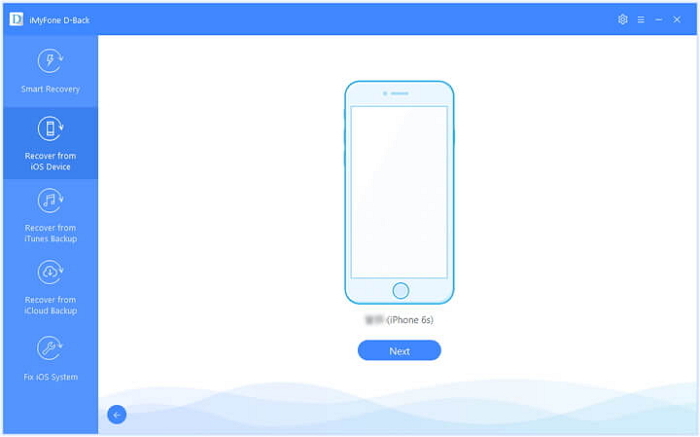 iMyFone D-Back iPhone data recovery for Win or iPhone data recovery for Mac makes the recovery of iMessages that much easier no matter you use iOS 12/11.3 or previous iOS versions. The user interface is extremely user-friendly and a few simple steps is all you need to recover the messages. It is also very useful when you need to recover deleted photos, recover iPhone contacts and more. If you want to recover the iMessages directly to your iPhone, you can use the tool iMyFone iTransor to restore only Messages including iMessages from iTunes or iCloud backup to your device, and also merge the data with the current data on your iPhone. The other data will not be affected. I tried this and found a few messages, but still can’t find one I am looking for. Any suggestions? Hello Mary, sorry for the late response. Which recovery mode did you use? Please try all 4 recover mode. And it’s better to stop using your iPhone from the moment you lost the messages, otherwise the new created data will overwrite the deleted messages and make them unrecoverable.